Bluegrass Pundit: McConnell trounces Bevin in KY Senate primary, but can he win in November? McConnell trounces Bevin in KY Senate primary, but can he win in November? In February, Matt Bevin polled better against Grimes than McConnell. 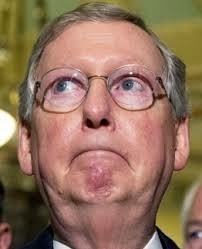 Mitch McConnell has poisoned his relationship with many conservatives and Tea Party supporters. It's unlikely they will turn out with enthusiasm for him. McConnell can't win without them. McConnell's victory sets up a closely-watched and expensive contest against Secretary of State Alison Lundergan Grimes, one of Democrats' best hopes at a GOP pickup this cycle. Grimes also easily won her nominal primary on Tuesday.